Lucky was the first name to come to mind, since he came so close to being put down. His time was up at the shelter, when they called us. We guilted them into a couple more days, to get a place for him, since he had been there two weeks and they called us on his last day. He had been found as a stray and was emaciated and battling a tape worm. In spite of this, he always had a happy go lucky personality. Friendly, sweet and playful no matter what. A very loving couple met and fell in love with Lucky. He has been in his forever home for eleven months now, where he is very loved, and is blossoming. He is doing therapy dog work at nursing homes. He has also been included in the year 2000 Keeshond Rescue Calendar which raises money to help more dogs like him. 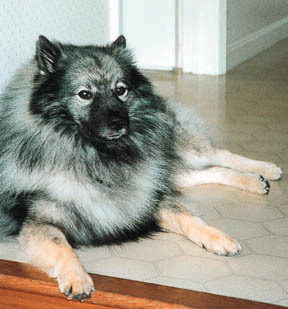 For more information, see the Keeshond Rescue Home Page. Lucky also describes the people who adopted him. Lucky is a real joy!! !